Welcome to the first edition of The Sunday Inquisition - a look at what the weekend of Rugby League threw up and why it should matter to you. Every Sunday for the rest of the season on wdnicolson.com - these observations will be presented in note form for your consumption. If you think we have missed anything don't hesitate to email the author and you will be credited with your contribution. Alternatively let us know via The NRL Tweet on Twitter. If you want game highlights and Player of the Year Votes - click the link for the Results Blog. 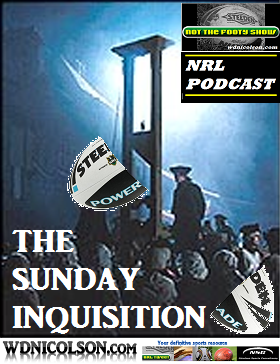 So here we go... the format may change as the weeks continue but we hope you enjoy début of The Sunday Inquisition. ROUND 18 RESULTS - Click here for the NRLTweet's Results Blog covering Stats, Injuries, Game Summaries and Votes for The NRLTweet Player of the Year. On Friday Night the Warriors and Eels posted identical 22-6 wins over the Titans and Tigers respectively - when was the last time we saw both Friday Night Games post the same score? So Parramatta get a win after a number of weeks of effort without reward. But if the Tigers had capitalised on their chances the result may have been another disappointing one for the Parra faithful. Jarryd Hayne at five-eighth - a LOT to like. For a start Parramatta didn't look impotent in attack and his raking boot gets used a lot more. The negatives is his defence isn't great and you lose his power running game. Your thoughts? Nathan Hindmarsh is Ray Price's love child. Has to be. Mr Perpetual Motion Mark II he most certainly is. The Tigers don't lack effort but they can't execute to save themselves. Having said that they have won a number of games this year by putting it together at the end of a match they didn't deserve to win. If you give up - you don't win those games. Nearly 20,000 at Parramatta Stadium on a Friday Night. It doesn't get much better... well it does if Parra lose and you're backing the other team. Why Parramatta let Feleti Mateo go continues to befuddle people. Micheal Luck is the second most important Warrior behind Manu Vatuvei. The Titans are ordinary... not exactly a news flash but this team was one win from the Grand Final last year and have basically the same roster on hand 9 months later and are 4-12 after 18 Rounds. Mat Rogers lasted one game in his comeback for the Titans. Announced on Twitter that he broke his foot, requires surgery and won't play again this year. Josh Papalii's groin injury robs the rest of the NRL from watching the Papaya King for at least the next few weeks. But at least the Cronulla fans got to see the boom youngster at work. Speaking of the Sharks - that's four wins on the trot and they get to test where they really are at next Monday Night with a visit to the Dragons. They are playing very well at the moment. Phil Gould said on The Sunday Roast that Wade Graham 'had Origin in his future'... maybe as soon as next season. WOW. Canterbury are an ordinary football team, but they did have a dig against the Storm. The attacking game plan got tweaked a bit in Adelaide but it could be a case of too little too late for Kevin Moore who inexplicably changed the Bulldogs style at the end of 2009 and the team has struggled mightily ever since. Ben Barba still doesn't really like having to catch bombs. But in his defence - would you? Ben Barba scored another try to lead the Try-scoring Charts with 14 on the season and it's a safe bet to guess you wouldn't be - so ease up on the criticism. Finally on the Bulldogs - can someone please explain why Channel Nine are choosing to show their clash with the Warriors in Auckland on DELAY Friday Night instead of the Broncos v Titans game? Yes the Titans-Broncos is a QLD derby but when you can watch a game of footy live you'll take that over two delayed games any day of the week even if it is your team playing. In this digital age where the score can find you even when you're not looking - this is a massive mistake by Channel Nine who are just gonna load up the ads in both games for NSW viewers and the telecast won't finish til close to mid-night! The Storm are 13-3 one season removed from getting dusted for - you know what - doesn't matter what you think of what happened or the punishment etc - this is very impressive given the number of journeymen types they've converted into valuable players this season. Translation - they've got like 7 or 8 players YOUR club didn't want in their lineup and they keep winning. Admittedly it helps to have Billy Slater, Cameron Smith and Cooper Cronk - but all three were developed by the Storm - never forget that. Bellamy also added the plan was to bomb the life out of Barba and Jonathan Wright. The Roosters snuck in a big win over the Panthers at the SFS - winning 34-26. Todd Carney was good in the first half and Mitchell Pearce strong in the second as the Roosters found out they could indeed still score points. The Video Ref over-ruling an on-field call to allow a Todd Carney play the ball was interesting... can't add much more than that given it held up a try to Phil Graham (who was sensational in his return). Gary Belcher put it well "too much ref speak for me (to understand the ruling)". Braith Anasta is an optimist apparently - interviewed after the game about how he felt coming into the match his response was "I'm a bit of an optimist, I thought we were going to win every game this year." Brian Smith said that Mitchell Pearce played with a bad shoulder. Should not have played this game and thinks it happened during Origin 3. Said Anthony Minichiello missed through a possibly stress induced illness. Smith again - couldn't understand why his team got the same referees for consecutive weeks. Petero Civoniceva's sin bin was a touch harsh... the Roosters weren't about to definitely score where they? But the ref in charge was the key - Matt Cecchin loves a sin bin. How good to watch was the Bunnies v Manly game? South Sydney at least turned up this week, scored 18 unanswered points then opened the door back up and Manly waltzed through. Nathan Merritt's foot was CLEARLY on the ground at the same time the ball was still in his hand. Inexcusable decision by Tim Mander - who rarely makes a wrong call in the Video Referee box. The age old questions comes up - same play in a Grand Final, scores level with 5 minutes left - No Try every day of the week. And Benefit of WHAT doubt? Spare me. Another big crowd at Brookvale Oval with 19,856 packing the hill to watch some Sunday Afternoon Football. Rabs said some interesting things in regards to scheduling of games - calling for more day football. Then he added "Maybe I shouldn't be saying that given I'm in television." At least he said it. But the only way Channel Nine can add 'day games' is to broadcast a Saturday 3pm game. Highly unlikely. Fair Falcon by Dave Tyrrell in the 26th minute. The flop is back in the game in a big way and the NRL bosses - Bill Harrigan and Stuart Raper need to take an axe to it NOW. Finally (you've done well to get to this final point!) - if you can see a replay of the Bunnies-Manly game - you must at least watch/listen to the commentary from Phil Gould and Andrew Johns as they broke down the first Kieran Foran try. It will be linked when available. The insight into the Foran-Glenn Stewart-Brett Stewart interaction was a clear example why these guys get the big bucks and other guys find themselves in the studio. So there is the Sunday Inquisition for Round 18. Next week it will likely be shorter and possibly in a different format altogether - so please let us know how to improve it and if you enjoyed the first edition in the comments or via a reply and retweet on The NRL Tweet. PS. Ok this is the last point. Mal Meninga is making some noise north of the border about something or rather in relation to how the Origin Series was covered/conducted. But when you've won SIX Origin Series in a row - that's what is important and for New South Welshmen and Women - the 2011 series is over and Mal (as much of a legend as you are) no one down here really cares if you spit the dummy AFTER the series. You won! That's really all that matters and really all we are forced to respect. After all - Darren Lockyer credited the NSW players for their "Outstanding sportsmanship during the series" - and surely that counts for something Mal? PPS. Author Note. Mal is a hero of mine... but this outburst seems a little sad. Catch NOT The Footy Show on iTunes Every Thursday during the 2011 NRL Season.